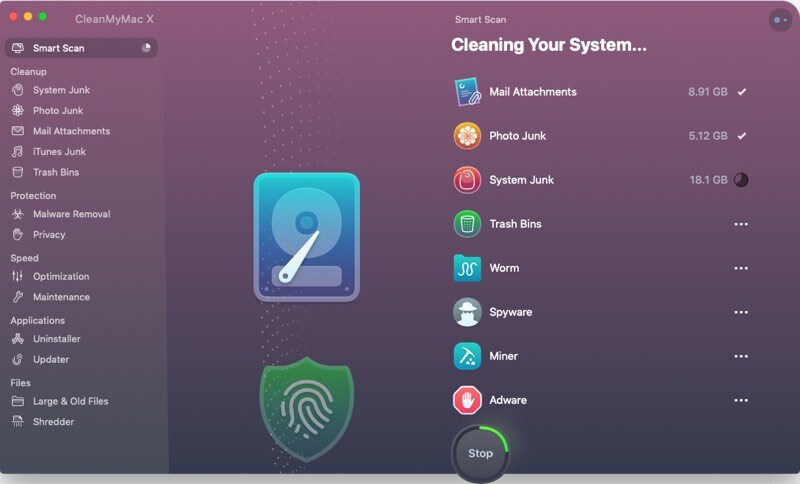 MacPaw today announced the launch of CleanMyMac X, an updated version of the CleanMyMac software that's designed to help users get rid of unwanted files and clean up space on their Macs. According to MacPaw, CleanMyMac X offers up a new Malware Removal option along with 14 tools for optimizing macOS. It also offers a Menu app for quick access to CleanMyMac X options, an extended Safety Database, and personalized cleanup tips. A Smart Scan feature offers up a quick, complete scan of the Mac with options for Cleanup, Protection, and Speed to remove unnecessary system junk and malware while also offering performance optimization tips. Scanning with CleanMyMac X is up to three times faster than the previous CleanMyMac 3 software, while the newly implemented Malware Removal tool will check for vulnerabilities and get rid of suspicious files. An optimization module provides tools for managing login items, launch agents, and apps that are absorbing too many system resources, and a built-in assistant will provide explanations, reminders for regular checkups, and additional optimization steps that are meant to improve performance. All of these tools are run when using the Smart Scan option, but there are also individual controls for cleaning up system junk, photo junk, mail attachments, trash bins, and iTunes junk. Malware scans can also be conducted individually, as can optimization scans, and there is a built-in uninstaller and updater for application management. MacPaw is charging $39.95 per year for a subscription to CleanMyMac X, or $89.95 for a one-time purchase, but the new software is also included in Setapp, MacPaw's Mac software subscription service priced at $9.99 per month. Setapp offers more than 100 apps for the $9.99 per month price tag, including titles like iStat Menus, Bartender, Ulysses, Canary Mail, and more. Note: MacRumors is an affiliate partner with MacPaw. When you click a link and make a purchase, we may receive a small payment, which helps us keep the site running. I'm a big fan of this site and understand you need to make ends meet, but there needs to be a point where your editorial ethics take hold. This is a crap program and you should, if anything, be discouraging people from using it. I don't care if you're an affiliate partner. If this is the stuff you'll be promoting for money, then myself and others will happily stop being contributors. Why is it a crap program? Asking for a friend. Every time I see CMM mentioned there are these arguments. I don’t know why. MalwareBytes correctly detects this application as a PUP (potentially unwanted program). That should say enough, but I'll expand. It's very aggressively marketed and incorrectly promotes the idea that you need to carry out constant maintenance on your Mac. This is profoundly wrong. Full of nice little animations to satisfy the Candy Crush generation. This tricks people into thinking their Mac’s running faster as a result — yet a simple restart would do just as much, which CMM will do anyway. It’s amazing how much goes wrong on macOS with a large 30 day uptime. You don’t really know what it’s deleting. Not only is this incredibly dangerous but there have been instances where it’s caused damage to the operating system. It used to be promoted as “on average, clears 50GB of data from a Mac.” On average. Now that’s either one of two things: an outright lie, or a terrifyingly high number. That should not be right. As if that’s the criteria for a good application. It’s never bricked my computer so it must be fine, right? This application promotes ignorance about both good computing habits and how macOS works. At the absolute best case scenario, there are many other free apps which do the same thing CMM does and provides more information on what they’re doing. There are countless seas of threads about this. Avoid cleaner apps on both Mac and Windows. Practice good computing habits and use MalwareBytes. It’s as simple as that. This app is a waste of money. Just use DaisyDisk to locate and clean up stuff if your computer is really full of junk. Anything else you’re clearing out will slow down your computer temporarily as cache is rebuilt...unless of course you believe this company has insider knowledge above and beyond that of Apple’s own engineers. Remember, remnants of old apps are smaller than the CMMs install file and if they aren’t, DaisyDisk will make that obvious. Hey Macrumors, can you please mark ads like these at the beginning so people don't get fooled think its an editorial article but an ad? Thank you! Almost as bad as mac keeper. stay away. If you want to clean something use OnyX it's free and does what is needed. This is one of the better posts I’ve seen on Macrumors. Good job, sir. If you have problems with space, use DaisyDisk to see what is hogging you SSD/HHD space. if you have problem with programs, startup and such, go to system preferences -> users and groups -> login items and disable it there. A lot of negativity here...has anyone actually had their computer damaged by this program?? Not trying to take sides, just wanting some data. ...but I like the fact it's included in the Setapp subscription. If you can find a few other apps within Setapp that you like, it becomes a pretty compelling subscription plan. There is no such thing as a "compelling subscription plan" in my book. The subscription model is a plague of modern software selling. I absolutely refuse to subscribe to any software...and when a company makes that the only option (looking at you 1Password), I take my money elsewhere. If it suits your use, great. Just letting you know though that DaisyDisk ($9.99), Onyx (Free), and MalwareBytes (Free) is a better value. I'm a fan despite the naysayers. It shows me whats its deleting and what its doing. And the average of 50GB of data is somewhat true when you take into consideration that it cleans up the caches and you can use it to trim the attachments from mail and so on. And no, a simple restart will NOT do the same thing. If you have the time to search your entire drive after you remove an app, thats cool. I don't. I'd much rather push a button and have it gone. I don't know, I get that people don't trust these kinds of apps but I'm fairly certain that those same people have not used an app like this is years. Sure, you can use other apps like Onyx to do some of the same things, but for me, having one app that can do all that is worth it. Is it necessary? No, but I find it very useful. I might change my mind if it completely screws something up but having used it for at least 5 years now, I've never had a bad experience with it.